I had driven past this place well over a thousand times and never really knew it existed. Prior to a training for some CEU’s I met a former colleague for lunch and he suggested the Geisen Haus. Thanks, Craig. 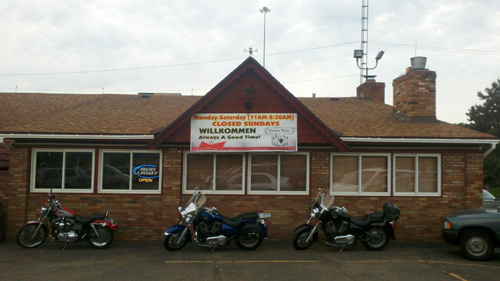 We had gotten along pretty well at Schmidt’s in Columbus so we thought we would give a more local German joint a try. It was exactly like I remembered it, primarily a watering-hole, I’m guessing but there were a number of people dining on both of my visits. It is nearly impossible to find from the road and without the sign alongside the freeway I wouldn’t expect anyone to know it was there. Maybe that’s the plan. When you find the little street and glance over the cratered parking lot you still wouldn’t be able to tell the place is a restaurant without some extra study. Inside it is dark and adorned in the standard bar fare with a German slant. The sandwich I had for lunch was great so I was hoping the dinner options were just as good. 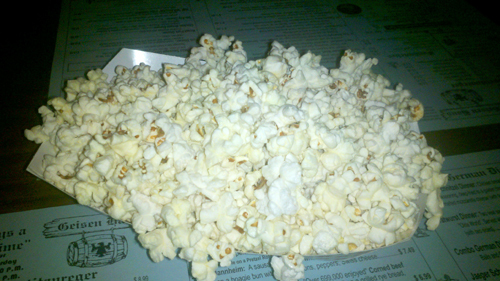 We were quickly approached by our server who offered us a basket of buttered popcorn, I guess they are sort of like German chips and salsa, and took our drink order. Here’s the thing about this guy. He is young, kinda punky looking, but this kid was created for the hospitality industry. Friendly, efficient, laid back, he was non-stop sensational. Don’t judge a book…. Time now to judge the fare. We studied the menu and ordered to try to get a taste of a bunch of stuff. It was here that I erred and completely misunderstood the server. We asked what was on the German Combo Appetizer and he said essentially the same thing that is on the German Combo dinner. As the other apps are essentially sides etc., I figured he meant everything on the German Combo dinner except for the protein. Then I ordered what would essentially be the same thing for dinner. Luckily, Steph figured out I am a moron and he happily changed the order so I wasn’t essentially repeating dishes. 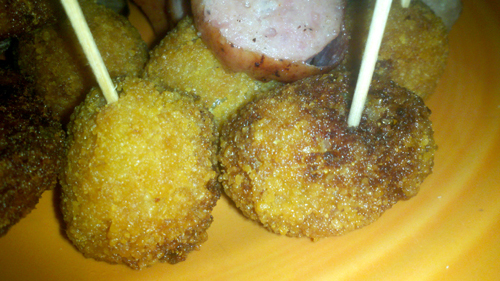 Anywho, enough about my stupidity the appetizer consists of slices of Frankfurter and Bratwurst. 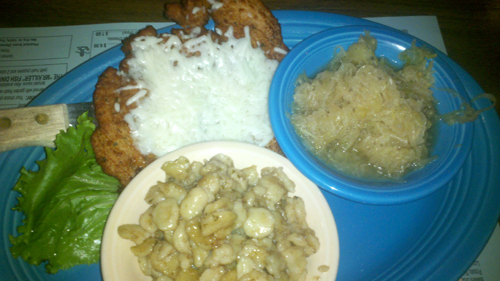 Alongside the sausages came potato pancakes, sauerkraut balls, and a monkey dish of sauerkraut. The sausages are real, no kidding around, German style encased meats. 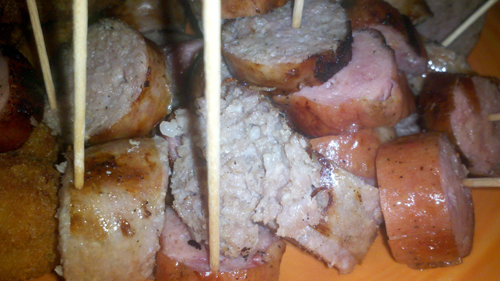 The Frankfurter was incredibly juicy and had the taste of a very high class dog. The veal based Brat is another level. Coarsely ground which gives it a unique to the American palate mouth-feel, it tastes delicious but very different from the ball park varieties. 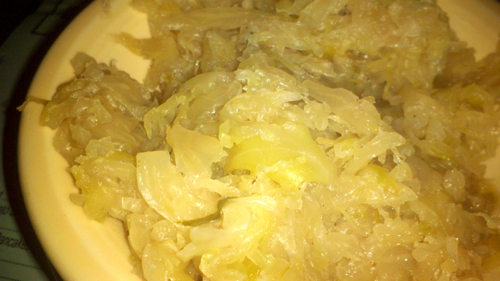 The sauerkraut is different than I am accustomed, it has a much less briny and sour flavor and seems to feature more of a “beefiness” than anything else. This made for good fried versions as well. 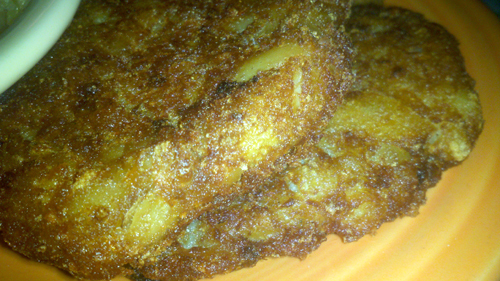 The potato pancakes were dark but had a crispy crust and a piping hot interior that offered little resistance in the way of texture, they must be pureed. A nice combo of crisp and lush. The menu says to ask for some of their homemade horseradish sauce, so I did. This stuff really brought everything to life. I ordered a second one to experiment with the entrées. I don’t mind it too much, but I have been a couple places that manage to cook thin proteins and still maintain some juiciness. 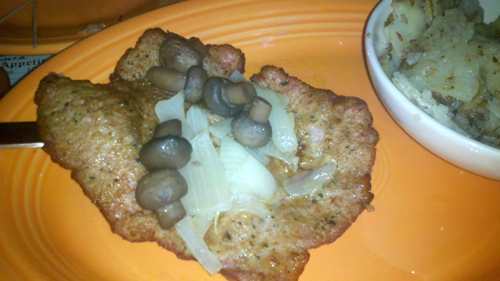 The pork didn’t get the layer of cheese and benefited from grilled onions and mushrooms instead. The coleslaw was no big deal, neither interesting or bad but it did help lighten some of the rest of the meal. The spaetzle noodles were thick and rested in a beefy gravy. 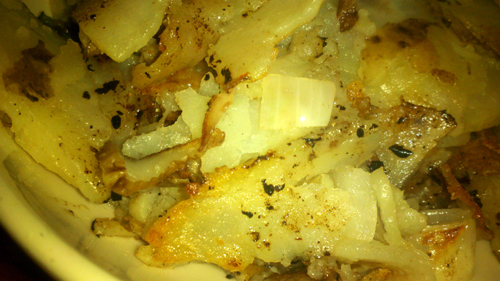 The German fries were essentially home fries with peppers, bacon, and onions throughout. They tasted fine. The mash was stupendous, light and rich, the perfect oxymoron of flavor. 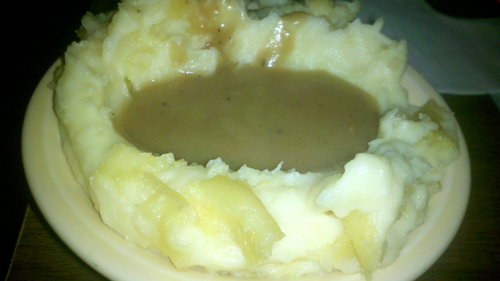 The gravy atop the spuds was a nice consistency and had healthy doses of salt and pepper which made for a great combo. It was the only starch we even got close to finishing, one thing about the menu of the Deutsche…they like their starches. My appetite and tolerance stalled at some point in the middle of the noodley/tatery sides…but the mash…too good…can’t be left…it managed to disappear. We left stuffed, maybe overstuffed. If you have a hankering to dine like “Ein Berliner” The Giesen Haus will certainly do. Just make sure you know exactly what is in your appetizer, order thicker meats if you like them juicy, and limit yourself to one starch to avoid coma.